I love Dancing with the Stars. I know it's kind of cheesy and hokey - and the "stars" aren't exactly A-listers - but man, oh man, the way those dancers make their bodies move is just amazing to me. So I was more than excited to see the Dancing with the Stars Live Tour when it rolled into Mohegan Sun in Uncasville, CT last Thursday night. I had never been to Mohegan Sun before. I'm not really a casino person. But the first thing I noticed upon walking into the casino was the overwhelming smell of cigarette smoke. It was so overwhelming to me, I think, because I am used to there being a smoking ban in public places. So that kind of grossed me out. 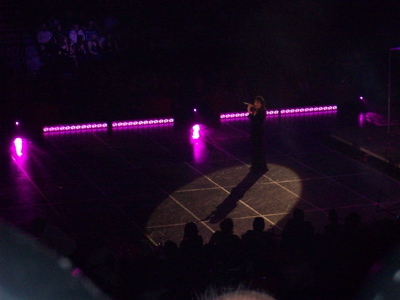 I had gone to the Dancing with the Stars Live Tour last year at the Dunkin' Donuts Center in Providence, which had more "stars" than this year's tour. Last year, Drew Lachey (love him! 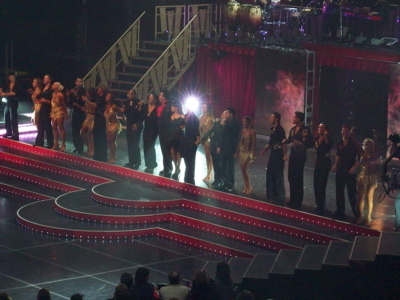 ), Joey Lawrence, Joey McIntyre, Lisa Rinna and Harry Hamlin were part of the tour. Watching Drew and Cheryl Burke (his dance partner) perform their "Save a Horse (Ride a Cowboy)" routine was a major life highlight of mine (don't feel sorry for me; I do have a life!). This year the "stars" were Joey Lawrence, Marie Osmond and Wayne Newton. Now don't get me wrong, I love Joey Lawrence. But I'm kind of over seeing him and Edyta Sliwinska (his dance partner) perform their routines, especially after seeing them live on last year's tour. Marie Osmond? Eh. She sang solos more than she danced. I think she danced two times with Jonathan Roberts (her dance partner). Her other appearances were her songs, which the older people in the crowd were loving. Personally, I could have done without them. 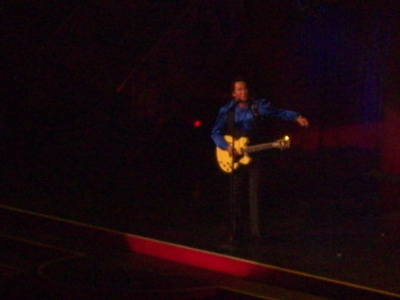 And Wayne Newton. Well, it was cool to have the opportunity to see this living legend live on stage. He truly is an entertainer, and he really seemed happy to be there. But he didn't dance at all. I mean, I know he had a heart ailment that kept him from performing at the finale of Dancing. But again, the show is called Dancing with the Stars. Just a thought! The company dancers were fantastic, though. They performed most of the actual dances. And their bodies!? Holy crap. Freaking. Amazing. So, all in all, I give the show an 8 out of 10. I would have liked to have seen more dancing... with the stars. But the energy of the show was great, and as for motivation for hitting the gym? Oh yeah, totally there. I would just suggest that Mohegan Sun consider a smoking ban because walking through the smoke-filled casino kind of sucked. Not that Mohegan Sun is listening! He shaved his head! OMG. Or, in classic Joey...."WHOA!" For me, the best part of Dancing with the Stars is seeing that our fave celebs CAN ACTUALLY bust a move! I mean, they're already known good as actors (though not specifically A-listers), yet knowing that they can dance is icing on the cake!